While not necessarily a scam, but still in "Beware County"
If it looks like Mercedes Benz, honks like Cadillac and weighs like BMW, but costs like Lada, what is it? BTW, I never knew Lamborghini, Mercedes and BMW are Cadillacs of the industry. Paypal has many critics. Here is one of the most vocal. When I offer something on Ebay I often offer to pay basic shipping fees if payment is made via wire transfer or cashiers draft. You can generally suss out whether a transaction will be safe. In any case, Paypal isn't always as safe as they'd like you to believe. For Paypal to refund fees in the case of an unhappy event the seller would have to have funds in his account sufficient to cover the amount of the sale. Danger: AVG Search-Shield has detected active threats on this page and has blocked access for your protection. * Click the “Back” button on your browser to return to the previous page and choose another link (recommended). Regarding the phishing caution- I just went to the paypalsucks.com site with no problem. My Mac is generally very useful in detecting fraudulent sites. I also went to merchantinc.com with no problem- via a link that was on the previous site. Let's hope that the nefarious Paypal doesn't have gremlins wandering over the net, interfering with our surfing. But will keep away from it anyway. Another ebay scam doing the rounds is fredericc233(just google frederic233 ebay to see dangers listed) who claims to be waiting for payment for an ebay numbered item and one is very tempted to click but in fact it is a very detailed phish. DONT click and watch out for similar. See link below for just happened ID theft and other similar. It is also indicates why pseudonyms may be useful for making like difficult for scamsters. I cannot find the CNET link for the discussion on pseudonyms about a month ago -- I thought it too complicated to rehearse all the security argumenets in favour -- but my comments would have been similar to some of those in this link below. BTW there are a number of bike patrol policemen who are members of the my-mc forum so they are not unaware of what crooks get up to -- and can still be victims. There is a 40b Wheatstone Anglo that has just appeared on ebay. Although the feedback looks good, this is obviously a case of stolen identity as the sellers profile is clearly from Singapore and yet, for the concertina, is listed as Virginia. 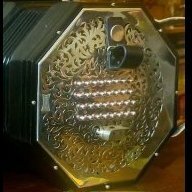 Also the concertina auction page states that no bids will be accepted, only a Buy It Now price of £1000 to be send directly to an email address. And both right-hand ends, at that. Well, the photo of the 38-button end is identical to this photo on the Suttner web site. If not a scam, the seller has gotten quite confused and posted the wrong photo. The seller's description says it's a 30-button+drone+air, and also says it's Suttner serial #012. And perhaps the seller doesn't speak/write English, as the English text appears to be copied verbatim from the description of the A3 model on this page of Suttner's web site. What's your guess Jim? Lazy advertising, scam or mistakes? And my German isn't good enough for me to try contacting the seller with questions. Maybe one of our German members can learn more? The Suttner #12 was a genuine sale that was finished off ebay later on the same day it was mentioned here. http://london.craigslist.co.uk/msg/2050732174.html - be careful! Scams! I think that is taken from an ebay listing of mine from a while back. The photos certainly look like mine. The same announcement from Internet http://www.adpost.com/us/musical_instruments/4491/, but now in California. If you interested, write me PM, I`ll tell you all details of my chat with them. I'm pretty sure this is a case of stolen identity. There are a lot of concertinas and melodeons. No pics. Paul, I notice this Dipper seller hasn't posted any photos either. Should we be suspicious of this one, too? the asking price on all 3 is £4750. None have photos. The descriptions are minimal. It is the same seller advertising the Dipper, though there is a more extensive description in that case.